Eco-Tip 2 - Think Long Term…Really Long Term. Well, somehow two weeks have already gone past, and it’s time for another eco-tip. This week is going to be an easy one for me because on Sunday I saw a truly beautiful concept: truly long-term thinking. Out of pure chance, I ended up at the Long Now Museum in Fort Mason, where I saw a prototype for a clock that will use solar power to run for approximately 10, 000 years. The idea was beautiful because it really blows the top off of most environmental thinking these days. So much talk is given to global warming, that it seems like we’re forgetting the whole point of the environmental movement. The point is not that the world is getting warmer, or even that the climate is changing. The point is that if the climate changes very much, we’ll probably all die. It’s like the joke about having a fear of heights: It’s not that you’re afraid of being up high - it’s that you’re scared that if you fall, you’ll hit the ground and die. Anyway, I digress. 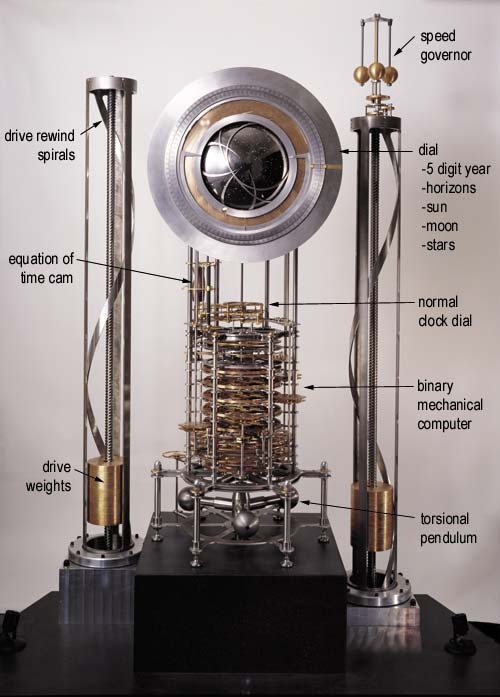 As I was saying, the Long Now clock is a clock that will synchronize (and probably charge) itself with the sun every day for a very long time. Obviously, the idea is not to track the time from now until 12, 007CE. The idea is to try to imagine what it would take for us to live that long. It kind of looks like we might annihilate ourselves before this clock ticks its last tick, but it’s somehow nice to know that if we do something that foolish, at least this clock will sit there happily ticking without us. This week I invite you to check out their site (which is awesome), and to imagine where we might be in 10,000 years. I predict that ultimately we won’t be here (but at least the clock will).